Rule Three: In case of any misunderstandings, refer to Rules One and Two. Feisty, high-energy, adorable – when referring to dogs, these words all bring to mind the fun-loving Parson (Jack) Russell terrier. Just had our 1st visit with our Vet today and our little one is the Healthiest Puppy in Town! The veterinarian was impressed with her disposition to no end! She was thoroughly checked for signs of hip displacement and passed with flying colors — and checked for range of motion on all leg group – 100% and Full Range of motion! She has Perfect Heart rhythm and sound Lungs. What a Beauty is what the Vet said! And let’s not forget her worm test – None of course! You have delivered a Perfect Puppy and I am sure that everyone in your Puppy Family over the years can say the same! Thank you for a wonderful and seamless transaction! I’m sure you get this email every time you send home a new puppy, but I’m telling you this one is different!!! This is not just a happy new puppy owner, this is what I needed in my life!!! My heart is SO full!!! I see 100’s of dogs every week, I have had so many of my own that I loved, but this one, is my 4 legged soul mate!!! I’m serious! Anyways, you must know that this is priceless, I can’t believe we have been so lucky to have found you, found him, I just can’t even put it into words. 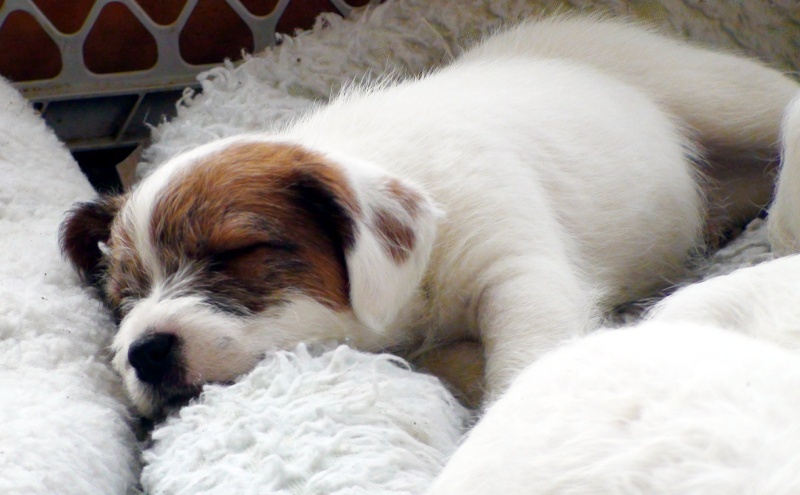 We have Parson Jack Russell Terriers For Sale – New litters at regular intervals throughout the year, why not message us today to get on our waiting list so you can one day own a healthy, intelligent and fun puppy!